Mushi-Shi is a 26 episode Drama/Mystery/Supernatural anime based on the manga by Yuki Urushibara, published by Kodansha, and licensed by Del Rey. Director Hiroshi Nagahama and studio Artland (Gunslinger Girl II, Demon King Daimao) are responsible for the anime, with FUNimation as the American licensor. The story features ubiquitous creatures called Mushi that often display supernatural powers. They are described as beings in touch with the essence of life, far more basic and pure than normal living things. Due to their ethereal nature most humans are incapable of perceiving Mushi and are oblivious to their existence, but there are a few who possess the ability to see and interact with Mushi. 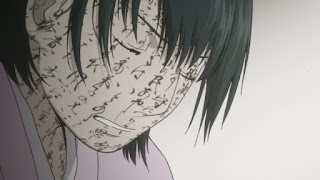 One such person is Ginko, the main character of the series. He employs himself as a Mushi master, traveling from place to place to research Mushi and aid peoples suffering from problems caused by them. The series is an episodic anthology in which the only common elements among episodes are Ginko and the various types of Mushi. 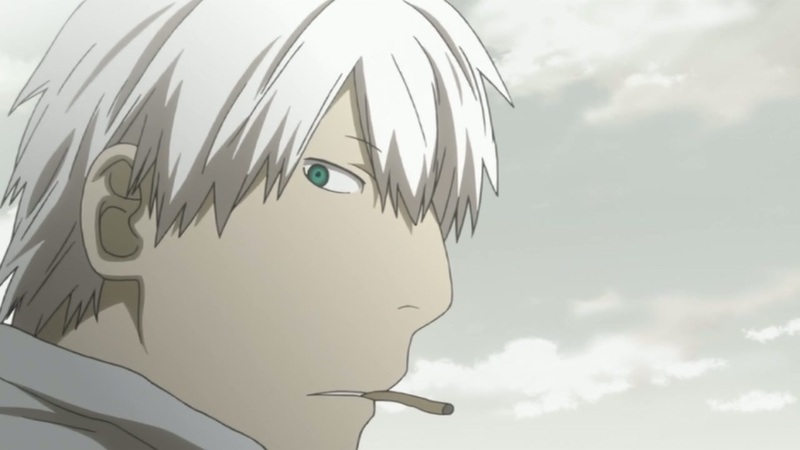 Mushi-Shi is absolutely gorgeous! The art style, the music, just everything is beautiful and you can’t look away from it. The Mushi, in particular, are stunning eye candy. Their different shapes, forms, distinct personalities (they don’t actually have personalities, but that’s what I’m calling it) alone makes the series enjoyable. The music is amazing, too. Toshio Masuda (Naruto, Ghost Hunt) made this world come to life with the music he composed. And if I end up crediting the composer in my reviews, which I normally don’t, that means you done good sir (considering the last time I mentioned a composer’s name was Yoko Kanno in both Cowboy Bebop AND Wolf’s Rain). Another unexpected surprise, was the opening theme. The opening theme is just some sort of shifting screen saver with a completely English, acoustic, song for it. Yes it’s in both the Sub and Dub, I checked. I didn’t know what to expect, but this works rather well. Usually, when you get a series like this, they would try to make it epic and awesome in some way. But Mushi-Shi went the opposite route and decided that it’s going to be what it’s meant to be, and it goes there; and the series really benefits from this choice. The series, visually and musically, is one of the most soothing things I have ever had the pleasure of seeing and listening to. Now, when it comes to story, I’m not much of an episodic story person. I like one consistent story throughout my entire series to make it more interesting and to have something to follow. If you don’t believe me, read my xxxHolic rant from last year, and you will understand. However, there are a few exceptions I can get behind, like Cowboy Bebop and Samurai Champloo because their stories actually have some sense of actual overall plot mixed in. With Mushi-Shi, it has no constant plot, but I’m not bothered by this in the least! 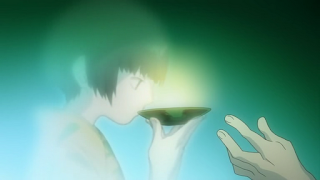 It’s not a series where it starts some plot in the first episode and then drops it for the remainder of the series, like xxxHolic does, and this helps Mushi-Shi a lot. Each episode seems like some sort of fairy tale or urban legend that lasts for that episode, and then Ginko just moves on to the next one. With no actual plot line, the viewer can focus on the current story and, even, become amazed with the different Mushi involved in that episode. 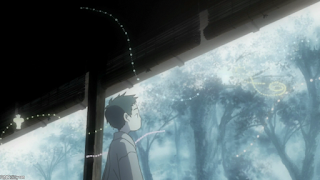 Mushi-Shi also has some of the best writing I have seen in a long time. It’s up there with Bebop, no joke. There is a downside to this episodic story telling. The only real character the viewer can focus on is Ginko. This isn’t a bad thing, no, cause Ginko is awesome to watch. However, because of the series’ episodic nature, each episode has characters pertaining to that episode. At the end, we never see them again. The only exceptions to this are Adashino and Nui, but even they are only seen in few episodes. This only works well because of the nature of each story that plays out per episode, and also the people Ginko encounters in his travels. I actually took the time, this time and watched the series in both languages, so let’s see how this goes. With the English version, the voice acting is really top notch performances. Travis Willingham (Full Metal Alchemist) was a big surprise for me as Ginko, because he brought a softer tone to his voice then the only other character I’ve been used to seeing him as, FMA’s Roy Mustang. This is the same effect that Last Exile had with Johnny Yong Bosch’s character Claus, except, Willingham makes Ginko more believable in his knowledge and curiosity of the Mushi. As for our other characters, Chuck Huber, Luci Christian, Laura Bailey, Brina Palencia, Vic Mignonga, and others bring forth a cast of fairly colorful characters with their stories. The down side to this dub, is voice actors tend to play a role in several episodes, and you can tell when this happens. For instance, Brina Palencia plays four characters throughout the series (not counting the child form of one of her roles in the same episode). Compared to the Japanese, I couldn’t find anyone with doubled roles. This makes it so much better because you don’t have the moment where “Hey! I know who that is!”. As for good old Ginko, Yuto Nakano (Casshern Sins) makes Ginko sound younger then Willingham’s interpretation. If I had to have a preference, the it would be the dub for me. But both versions are well done so, to each his own. Something a lot of people may not realize, is that Japan takes a lot of things from Western Civilization and uses those in many Anime now a days. I mean, come on, Samurai Champloo went the breakdancing route with one of it’s characters. So it’s extremely rare for a purely Eastern series to come out of the wood work and actually have an impact on everything. 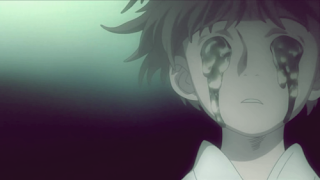 Mushi-Shi is one of those series. All of the stories, the culture, the music; everything has the look and feel of an authentic Eastern Culture, and, with it’s art style, the series benefits from it’s different take on culture. 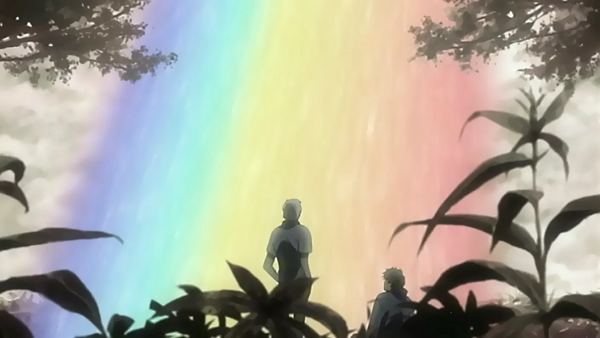 The other downside to Mushi-Shi, besides it’s characters, is it’s soothing nature. Mushi-Shi isn’t meant to be an exciting or thrilling action packed like a lot of series around, now a days. And it isn’t one you can just sit down and marathon during the day. Mushi-Shi is more for those times when you come home from a long day or work or school. When you can curl up on the couch with some Hot Chocolate (I hate tea and coffee) and just want to relax for the night. Kind of like curling up with a good book, in bed, in order to fall asleep. 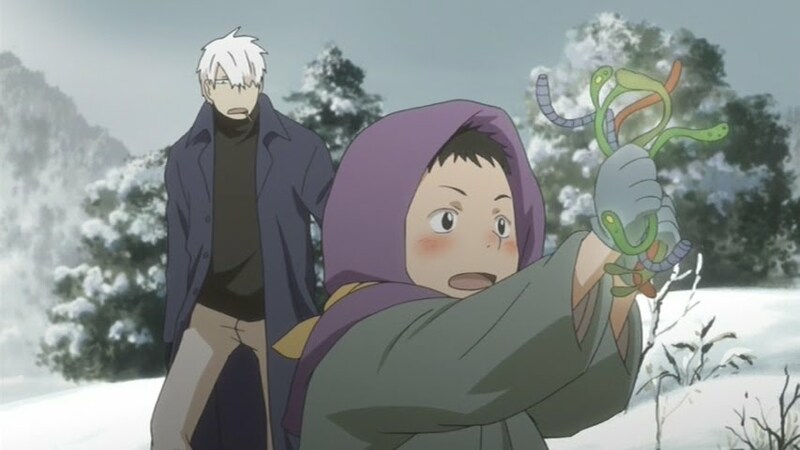 What Mushi-Shi brings to us is an amazingly well written series of stories about mysterious creatures that no one has ever heard of and very few can actually see. It’s one of those series that can be called unique because of its style of art, storytelling, and music. This isn’t one to pass up if you’re the kind of person who is looking for something different then the average anime or, heck, even TV series we’ve all been seeing as of late. However, I do caution you that this is more of a bed time story rather then a marathon type of series, so get in a comfy bed before you watch. If you’re looking for something similar, but maybe with more excitement, then Cowboy Bebop and Wolf’s Rain are ideal choices. But, for something more mysterious, but not as good in the story department, xxxHolic and Umineko no Naku Koro ni isn’t a bad choice either.